Case 3A. New Tech: Where Will the Money Come From? Are the Risks Properly Assessed? Questions Case 4A. New Tech: Is Management Ready? E. Listing on a Stock Exchange Outside the U.S.
Dr. Vinturella was founder and 20-year President of a building supplies wholesaler, sold to a regional chain in 1998; Tammany Supply, Inc. was named a Blue-Chip Enterprise by the U.S. Chamber of Commerce in 1994 and was featured ("The Wizardry of Tammany Supply") in the trade journal, Supply House Times. He also participated in the startup of several small businesses as officer/owner, including a microbrewery, software developer, "cajun" food manufacturer, and quick oil change franchise.He taught at Dillard University, New Orleans, LA, USA and is currently a Business Consultant in Cincinnati, Ohio, USA. Dr. Suzanne Erickson received her PhD in Finance from the University of Washington. She taught at Seattle University for several years where she was instrumental in starting the Entrepreneurship Center. Currently she is the Associate Dean in the College of Business and Mass Communication at Brenau University in Gainesville GA. Her areas of expertise are Corporate Finance, Valuation and Entrepreneurial Finance. 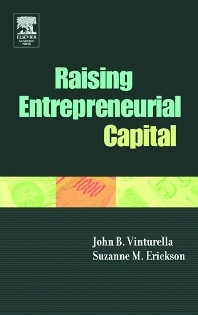 In addition to publishing several articles in the areas of corporate finance and Raising Entrepreneurial Capital, a text coauthored with John Vinturella, she has consulted with several start-ups, Fortune 500 companies and non-profits.